In these illustrations, I have likened the op-amp's action to that of a single-pole, double-throw switch, showing the "connection" made between power supply terminals and the output terminal. 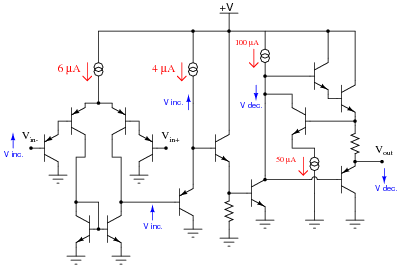 Determining which "way" the output of an op-amp drives under different input voltage conditions is confusing to many students. Discuss this with them, and ask them to present any principles or analogies they use to remember "which way is which." Also, write a mathematical formula solving for differential voltage gain (AV) in terms of an op-amp's input and output voltages. 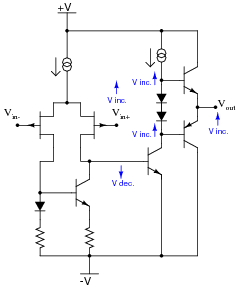 The calculations for voltage gain here are not that different from the voltage gain calculations for any other amplifier, except that here we're dealing with a differential amplifier instead of a single-ended amplifier. I encourage your students to learn how to power op-amp circuits with interconnected batteries, because it really helps to build their understanding of what a ßplit" power supply is, as well as allow them to build functioning op-amp circuits in the absence of a quality benchtop power supply. Qualitatively determine what will happen to the output voltage (Vout) if the voltage on the noninverting input (Vin+) increases, and the voltage on the inverting input (Vin-) remains the same (all voltages are positive quantities, referenced to -V). Explain what happens at every stage of the op-amp circuit (voltages increasing or decreasing, currents increasing or decreasing) with this change in input voltage. Qualitatively determine what will happen to the output voltage (Vout) if the voltage on the inverting input (Vin-) increases, and the voltage on the noninverting input (Vin+) remains the same (all voltages are positive quantities, referenced to ground). Explain what happens at every stage of the op-amp circuit (voltages increasing or decreasing, currents increasing or decreasing) with this change in input voltage. 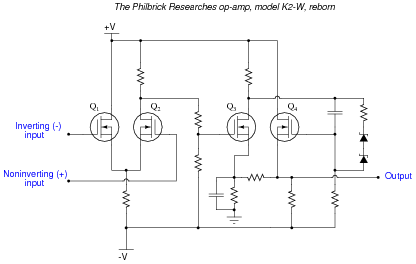 This question also provides the opportunity to draw parallels between D-type MOSFET operation and the behavior of triode-type vacuum tubes. As with D-type MOSFETs, triodes were "normally half-on" devices, whose plate-cathode current conduction could be enhanced or depleted by applying voltage to the grid (with respect to the cathode). I'll let you and your classmates have fun with this question! 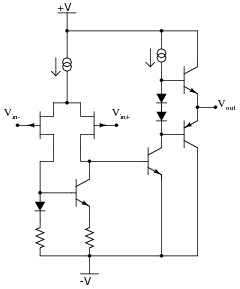 Although the model 741 operational amplifier is considered obsolete by many modern standards, it is still a suitable circuit for this kind of exploration with students. Being able to look over a schematic diagram and figure out what the components do is an important troubleshooting skill. The fact that human circuit designers tend to repeat specific circuit elements and "modules" (such as the common-collector amplifier or the current mirror) in their designs rather than invent something completely novel for each design simplifies the task of later interpretation. 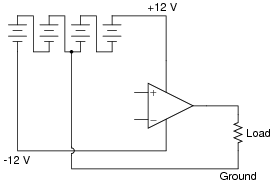 Ideally, what should the output voltage of an op-amp do if the noninverting voltage is greater (more positive) than the inverting voltage? 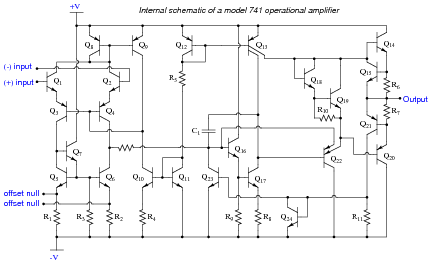 To elaborate further, imagine an extremely sensitive, analog, zero-center voltmeter inside the opamp, where the moving-coil mechanism of the voltmeter mechanically drives the potentiometer wiper. The wiper's position would then be proportional to both the magnitude and polarity of the difference in voltage between the two input terminals. 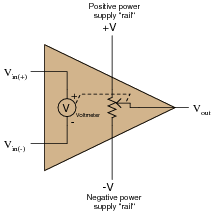 The output voltage of an opamp cannot exceed either power supply "rail" voltage, and it is these "rail" connections that either source or sink load current. 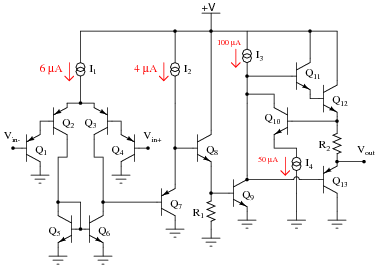 Students have told me that this opamp model öpened their eyes" to the behavior of opamp outputs, especially in situations where they would have otherwise expected an opamp to deliver an output voltage exceeding one of the rail voltages, or where the path of load current was critical. 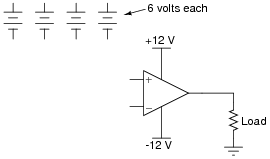 One of the common fallacies new students have about opamps is that output current somehow originates from current at one or both of the input terminals. This model also helps to shatter that illusion. As a new instructor, I used to be shocked to see such misunderstandings in my students' thinking. Surely from their previous experience with single-transistor amplifier circuits they knew the DC output voltage could never exceed the power supply rail voltages, right? Surely they understood that the current gain provided by multiple transistor stages effectively isolated output loading from the input(s), so that increased load at the output had negligible effect on input current, right? Well, not necessarily so! The important thing to note here is that the load current does not pass through either of the op-amp's input terminals. 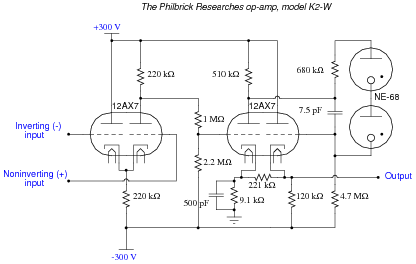 All load current is sourced by the op-amp's power supply! Discuss the importance of this fact with your students. 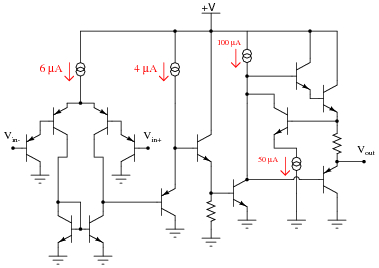 Ideally, when the two input terminals of an op-amp are shorted together (creating a condition of zero differential voltage), and those two inputs are connected directly to ground (creating a condition of zero common-mode voltage), what should this op-amp's output voltage be? Ideally, Vout = 0 volts. However, the output voltage of a real op-amp under these conditions will invariably be ßaturated" at full positive or full negative voltage due to differences in the two branches of its (internal) differential pair input circuitry. To counter this, the op-amp needs to be "trimmed" by external circuitry. 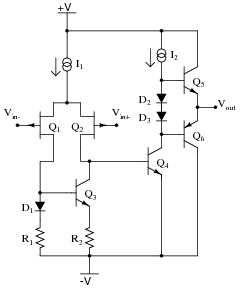 Challenge question: identify a model of op-amp that provides extra terminals for this "trimming" feature, and explain how it works. If possible, discuss how "trimming" works in a real op-amp. 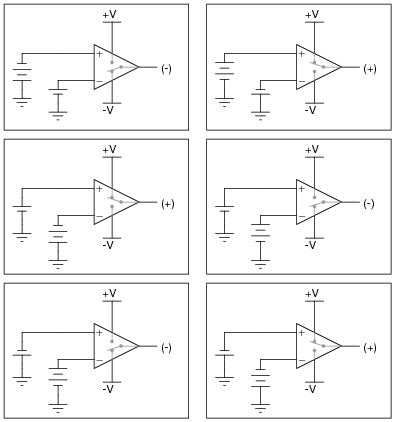 If your students took the "challenge" and found some op-amp datasheets describing how to implement trimming, have them relate the connection of external components to the op-amp's internal circuitry. What does it mean if an operational amplifier has the ability to ßwing its output rail to rail"? Why is this an important feature to us? Being able to ßwing" the output voltage "rail to rail" means that the full range of an op-amp's output voltage extends to within millivolts of either power supply "rail" (+V and -V). Discuss what this feature means to us as circuit builders in a practical sense. Ask those students who tackled the challenge question to look up the output voltage ranges of their op-amp models. Exactly how close to +V and -V can the output voltage of an op-amp lacking "rail-to-rail" output capability ßwing"? A very important parameter of operational amplifier performance is slew rate. Describe what ßlew rate" is, and why it is important for us to consider in choosing an op-amp for a particular application. 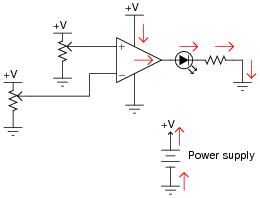 "Slew rate" is the maximum rate of voltage change over time ([dv/dt]) that an op-amp can output. 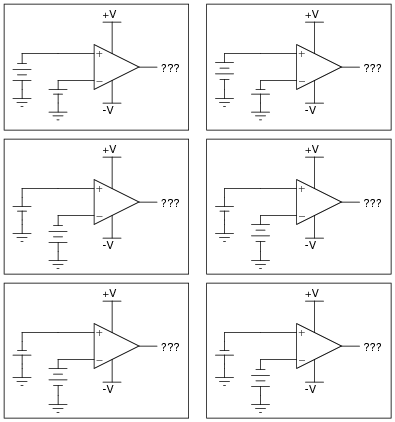 Ask your students why [dv/dt] might be an important parameter in a circuit? In what application(s) might we need the op-amp to ßwing" its output voltage rapidly? In what application(s) might we not care about the op-amp's slew rate? 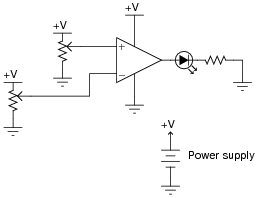 Some precision operational amplifiers are programmable. What does this feature mean? In what way can you "program" an op-amp? A "programmable" op-amp is one with extra connections to its internal circuitry allowing you to set the current source values using external components. 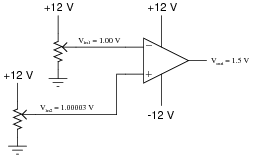 What possible benefits are there to "programming" the current source values in an operational amplifier? Discuss this with your students, asking them to share what they've found through their research.